Last seasons 3rd place finish as naturally raised expectations a little so I need to make sure we have the tools to continue our progress and job number one was to replace Simeone in the first team. Now like any half decent manager I have squad depth charts and transfer option charts for each position in the starting line up who I have my network of scouts run over with a fine tooth comb. 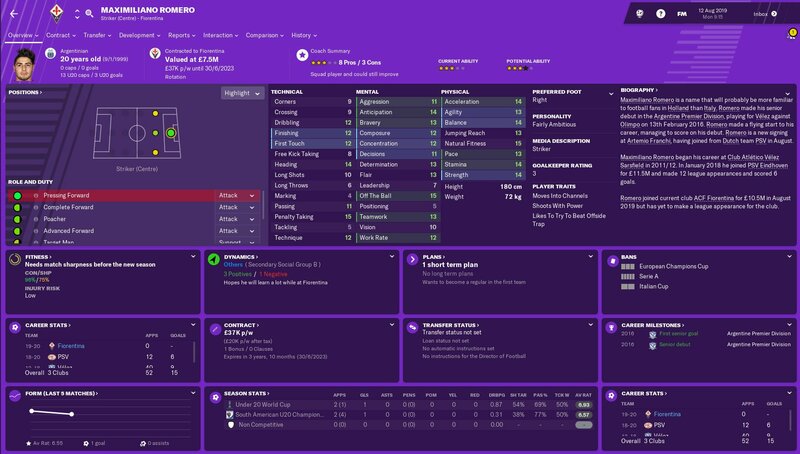 I really felt that to replace Simeone we would have to turn to the market because I did not feel that Dusan Vlahović, Gabrielle Gori, Simone Mazzocchi and Martin Graiciar were ready to take on the role of leading the frontline going in to a season of both domestic and Champions League football so I would be turning to my list of potential targets and reinvesting the Simeone money back in to the 1st team squad. ‘The board expect us to gain European qualification via our league position’. 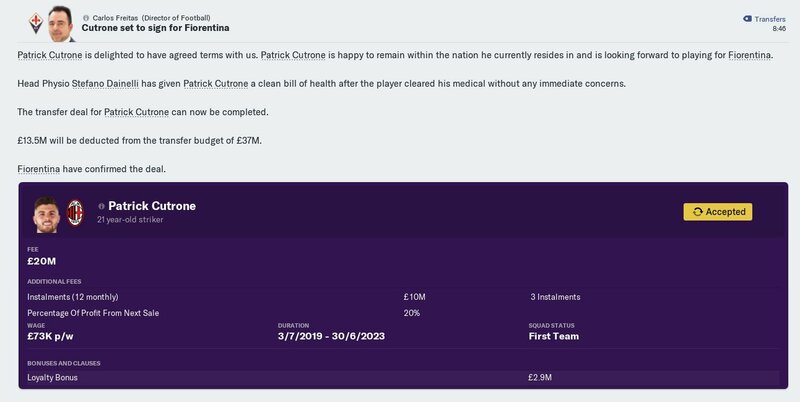 After analysing the scouting reports I chose to go after Patrick Cutrone the 21 year old forward from Milan for a transfer fee of £20m which in today’s market I think is a good deal for the young Italian. 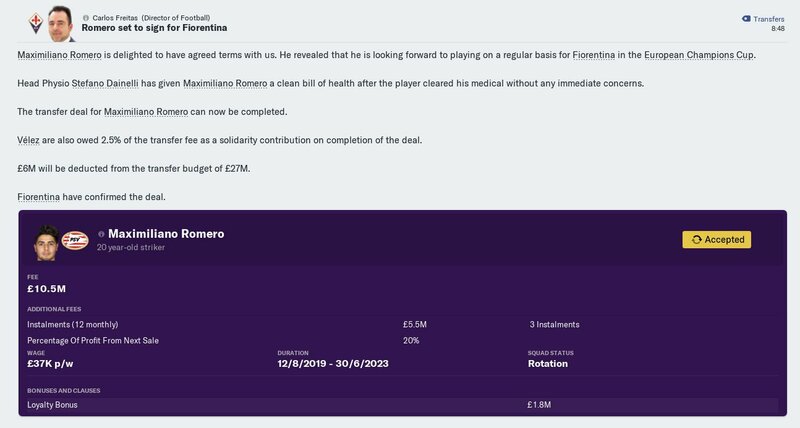 Whilst I was very pleased to have got Cutrone I decided to also bring in the Argentinian Maximilliano Romero for £10.5m. Keeping up the clubs Argentine connection I think the 20 year old forward offers a very good alternative to Cutrone going in to a season of European Football. Our third and final signing was that of Sassuolo winger Domenico Berardi a player who I am a long time admirer of. The 24 year old Italian joins us for a fee of £16m. 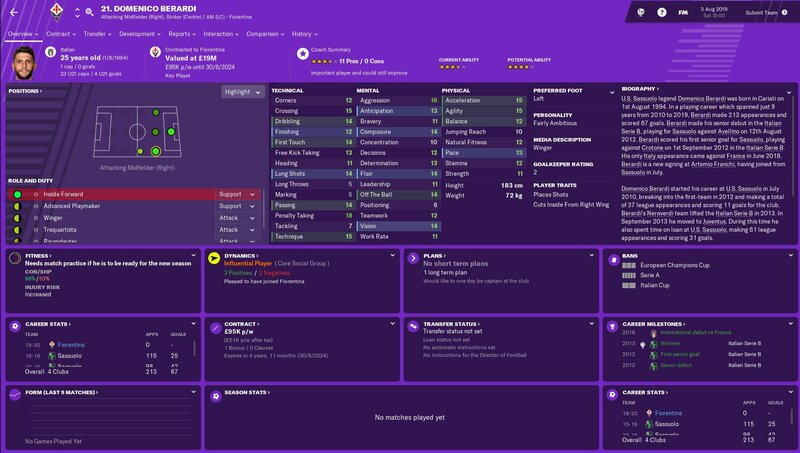 During season one and up to pre season I have released or sold around 60 players who I feel have no future at the club. I like to run with streamlined squads to enable players to get good game time through all our squads. Both of our youth squads the Under 18 and Under 20’s have 18 players in each. I feel this enables good game time through each squad. I will allow up to 22 players in each of our youth squads but after that it’s decision time. 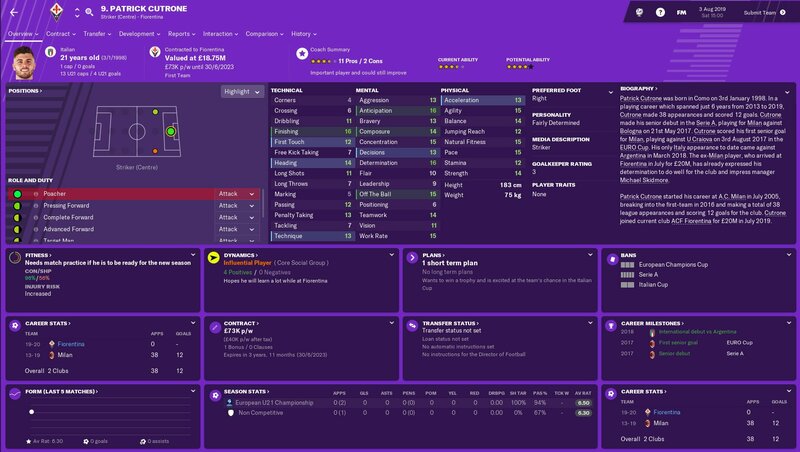 With the squad numbers streamlined this means that come the Youth Intake I may only offer contracts to 3 or 4 players instead of taking a chance on 8 or 9 or even more. So each intake will be governed by player development through the squads. If I get an intake of top quality potential players then it may mean that players already in our system will leave the club to make way for them. After a pre season of introducing the new boys to the first team squad the fixture computer had thrown up a tricky trip to Rome to face Roma on Matchday 1 of the new season. Roma started well and put us under some early pressure and took advantage of our below par start by going in at the break a goal to the good after Schick had scored just before half time. We started the second period a lot better and came close to an equaliser when Cutrone rattled the cross bar but it was Roma who got the second on the hour when Dzecko headed home what the Roma tifosi would presume to be the winner. How wrong they were when new boys Tonali and Berardi combined to send Cutrone in on goal to score on his debut and give us a lifeline in the 73rd minute. Suddenly we looked a different side and forced a corner after a first time shot from Cutrone deflected wide off a Roman defender, Tonali swung the ball over to be met by a towering German Pezzella who powered an header in to the Roma goal, 2-2 game on with ten minutes to play. Sandro Tonali and Abdou Diakhate were now dominating the game and it was the long haired Pirloesqe midfielder Tonali who sent the small army of Viola faithful in to joy and celebration in the 86th minute with a curling shot that nestled in to the back of the net to silence the Rome crowd and give us a dramatic 3-2 win that showed character on the opening day. There is no disputing Tonali’s potential and early signs are looking good on the training ground. With confidence at an high after our second half showing against Roma we put Lecce to the sword with three goals in the opening half hour with new boys Maximilliano Romero and Patrick Cutrone getting on the scoresheet with Abdou Diakhate getting the other. Now you may be thinking 2 Forwards in a lone striker system well it was all down to Romero picking up an injury minutes after scoring his first goal for the club meaning Cutrone was called in to action. The second half was a formality and we ran out 3-0 winners. A trip to Sardinia went horribly wrong when Cagliari handed us our first defeat of the season with a single first half goal in a game that both sides struggled. We returned to the Artemio Franchi for Matchday 4 and got back to winning ways with a resounding 3-0 win against Genoa with the same three scorers Cutrone, Diakhate and Romero from our last victory. Champions League group action next with a trip to Portugal to play perennial Champions League team FC Porto and after a goalless first half the Portuguese club turned on the style and uncovering our inexperience at this level giving us a 0-3 thumping. I take the blame and should have set us up better going in to the game. I have analysed our 2nd half showing and will learn from the defeat. An away trip to struggling Empoli and a chance to get the Porto defeat out of our system and we did just that thanks to goals from Jordan Veretout and Patrick Cutrone giving us a 2-0 victory. Matchday 6 saw the visit of newly promoted Palermo to the Franchi and they put in a fantastic rear guard performance to deny us a goal with both Romero and Diakhate hitting the woodwork but we had to make due with a 0-0 draw. 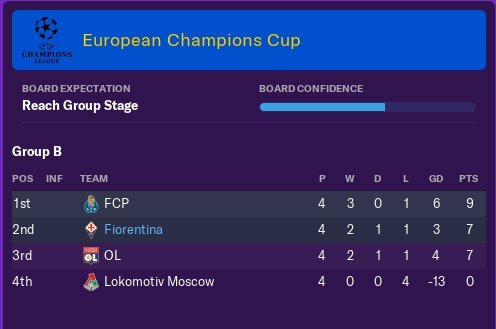 Champions League fever hit Florence for our 2nd group B game against Lokomotiv Moscow. I saw this game as a chance to rectify our opening day defeat and that’s what we done by giving our Russian visitors a 6-1 drubbing to send the Viola tifosi home happy and restore a bit of self belief. Patrick Cutrone netted a superb hat-trick with Riccardo Sottil, Nikola Milenković and Germain Pezzella also getting on the scoresheet. Sottil came in for the injured Berardi who looks like being on the sidelines for at least a month. Matchday 7 of our Serie A campaign away to Verona produced our 2nd back to back 0-0 draw which if anything was more frustrating to the fact we played well without taking our chances. The football we are playing is how I want us to play and whilst we are not scoring we are doing the right things and I am not panicking because I know it will come together. Matchday 8 saw the visit of league leaders Milan to Florence who have won their opening 7 matches without conceding a goal. I changed our system slightly by tweaking our midfield three slightly by changing the box to box role to a Segundo Volante to counter the form of Kessie who is enjoying a great start to the season in Milans midfield. My idea was to actually invite Kessie in to our defensive third an area were yes he could destroy us or were we could close him down and take advantage of a counter de stabilising Milans midfield. This would also put our powerhouse Abdou Diakhate in an head to head with Kessie when Milan had possession. Now I knew what I wanted to achieve in my head but getting it to work out on the pitch is another thing. 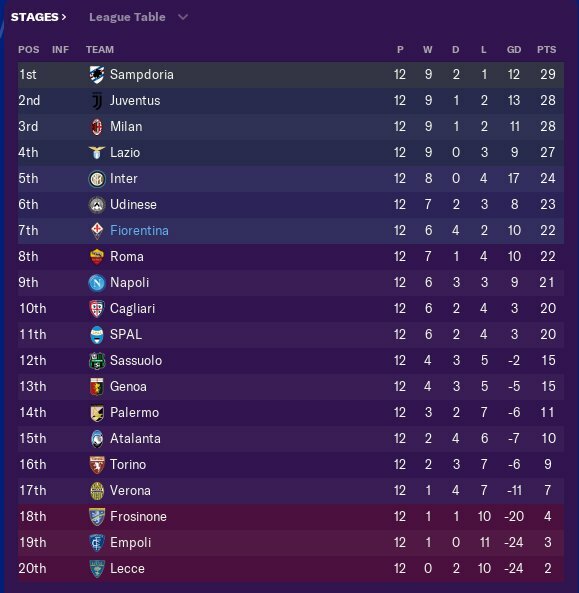 Probably one of the most satisfying things that most FM player’s achieve is when you put in to practice your vision and it plays out just how you see it, well I can honestly say that my plan to isolate Kessie worked like a dream and ranks right up there with one of my finest FM moments. Just 6 minutes in to the tie Kessie moves in to our defensive midfield strata with the ball but is out muscled by Diakhate who lays the ball off square to Norgaard who got the shout over Tonali for a starting place, he quickly finds Benassi with a vertical ball who lays it off in to space for the advancing Diakhate who finds Rafik Zekhnini with a diagonal ball to our left flank, the flying Norwegian whips a ball in to the box Goooooaaaal Patrick Cutrone turns the ball past Donnarumma 1-0 in the Franchi, Cutrone haunts his old club within 6 minutes. Just five minutes later Cutrone puts us 2-0 up finishing off a sweeping move that carves a bewildered Milan apart. Diakhate is bossing Kessie in the middle and both wingers Zekhinni and Sottil are getting success down the flanks and its Riccardo Sottil who puts us 3-0 up a lead that we take in to the break. I change to a defensive mentality for the second half and it works a treat with Milan grabbing a single consolation goal, it’s a good 3 points going in to the midweek Champions League tie. We travel to France in confident mood for our 3rd group game against Lyon who top the group. After a pretty even game we come away with a point after man of the moment Patrick Cutrone’s 15th minute strike to give us a 1-1 draw. Our next two Serie A fixtures produce two draws the first a 0-0 away at Torino who have been struggling of late. I think we are suffering a little European hangover and it boils down to me managing our squad better. Our second draw comes at the Franchi where we are held to a 1-1 draw against Atalanta with Patrick Cutrone getting the goal. With five draws from our last seven games we go in to our next Serie A game against Lazio in Rome looking to get back on track but our hosts have a different idea and hand us a resounding 0-2 defeat which for the first time in my reign puts a little pressure on me but I am not that concerned because I believe in what we are building. With all eyes on us we entertain Lyon for the Champions League matchday 4 at the Franchi and the boys deliver by beating our French visitors 3-2 with goals from Cutrone, Tonali and Romero that leap frogs over Lyon us in to 2nd place in the table. Serie A Matchday 12 sees us host Carlo Ancelotti and his Napoli side and we play well to win the game 2-0 with Federico Chiesa and Patrick Cutrone getting the goals. It was a good display against a dangerous Napoli side.